Nir Bitton has acknowledged Celtic's chances of reaching the Europa League are massively diminished following back-to-back defeats by Molde. The results mean the Norwegians have qualified while Celtic must win at home to Ajax and away to Fenerbahce to join them in the last 32. Israeli midfielder Bitton admits there is little cause for optimism. "After you lose two games in a row to Molde, you cannot think about beating Ajax and Fenerbahce," he said. "But, if we have the smallest chance to go through, we'll try to do everything we can. "In life, and especially in football, you never know what will happen in the future and we will see." 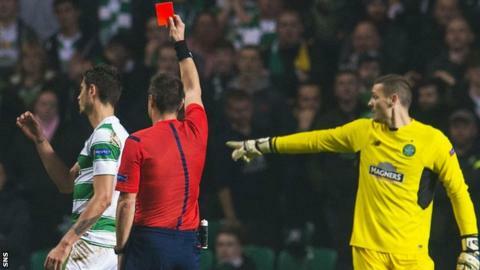 Bitton will miss the Ajax match having been sent off on Thursday night - the sixth successive occasion Celtic had conceded two or more goals in a European tie as the defence again looked nervous and fragile. "I think we make a lot of mistakes - the same mistakes in every game in Europe," he conceded. "Teams playing against us create too many chances. "When you play in the Scottish league, sometimes you don't get punished for that and, when you play in Europe, you get punished." That issue - first raised, controversially, by the Celtic assistant manager John Collins earlier this season - seems to be borne out by results. Sandwiched between the defeats by Molde, Celtic have comfortably defeated the second and third-placed teams in Scotland - Aberdeen and Hearts - and thrashed Dundee United. So is the gulf in standards too great for Celtic to be able to up their game? "I don't think so," said their midfielder, Stuart Armstrong. "Although they've outperformed us tonight, I don't think, man for man, they're much above us. "Perhaps if we'd gone ahead it would've been a different game, but it's not the case and we just didn't play as well as we would've liked to."